Residents are being reminded of the amended opening times of Colchester Borough Council services and venues this festive period. 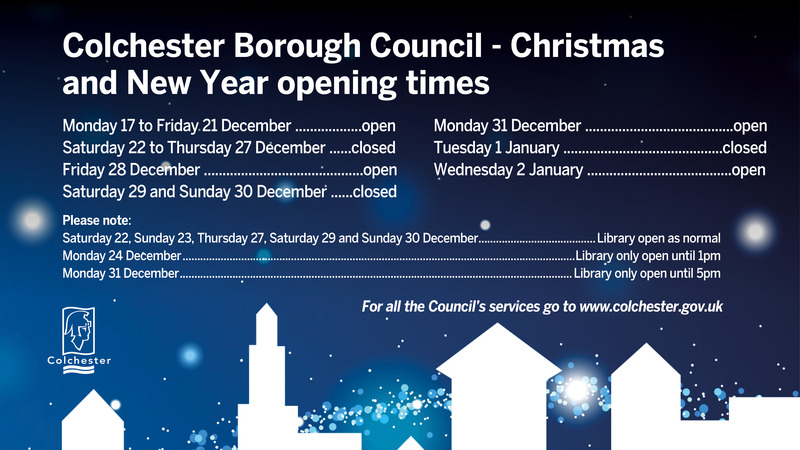 Read more about the key council services operating over Christmas and New Year, here. Want to visit us in person? Below are the opening times to the Community Hub where a member of the team will be happy to help you. Please note this is not our postal address for correspondence. Please click here to Contact Us for telephone numbers and email addresses for the different services we provide. For out of hours emergencies please call the required service number and select the appropriate option.